Meet your go-to guru for all things Ayurveda. We’re falling in love with Sahara Rose and her seemingly endless insight of all things Ayurveda. You’ve probably heard of Ayurveda, or at least seen some of the associated rituals, like dry-brushing, oil pulling, and the like. But all of this information can be a little bit intimidating if you don’t have a guide to help break down the basics—which is why we sat down with Sahara. Sahara is down-to-earth, articulate, and super knowledgeable about all things Ayurveda. As a holistic health coach, sports nutritionist, podcast host, wellness blogger, and certified Ayurvedic practitioner, Sahara Rose is able to approach Ayurveda from a variety of different angles, breaking it down in ways that nearly everyone can understand. We were super interested in Sahara’s routine, how she nourishes her body, and a few basic tips for newbies when approaching Ayurveda. Get the inside scoop below. You seem super grounded and collected. How do you get there? What’s your personal morning routine? I wake up around 7:00 am. Before I open my eyes, I try to recall my dreams—I have very vivid dreams and they always signal me messages on what I need to be working on or looking out for. Once I open my eyes, I name three things I’m grateful for and say this affirmation, “I am a channel of the universe, I am here for the highest service—please let me know how I can best serve, please show me the way.” It’s a grounding and inspiring way to start the morning, so I tend to say it several times! Then I go to the bathroom, brush my teeth with plant-based, fluoride-free toothpaste, scrape my tongue with a stainless steel tongue scraper to remove toxins, and take my daily Ayurvedic supplements with some room-temperature water. Then I put a spoon of coconut oil in my mouth for an Ayurvedic practice called oil-pulling, which further draws toxins from the system. This requires I swish the oil for about fifteen minutes, though I normally make it to ten. While I’m swishing (a totally acceptable time to multi-task), I go into the kitchen and turn on the hot water to make tea. My favorite is the Pukka Turmeric Glow. 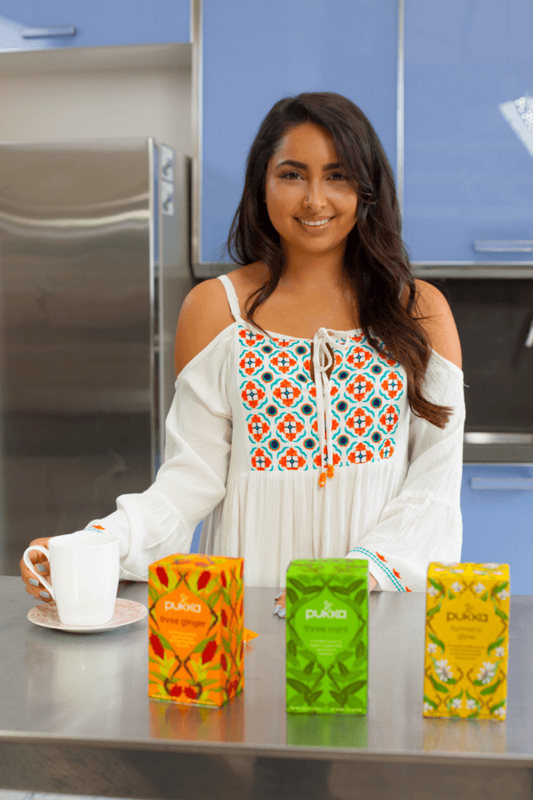 It really warms up my digestive fire for the day and I notice drastic changes in my mind, body and even mood from drinking it as Pukka’s teas are all 100% organic and inspired by ancient herbal wisdom. I allow the tea to steep and keep swishing as I get dressed for yoga. Then I spit out my oil, rinse out my mouth with warm water and salt, drink my tea, and head to yoga. I eat breakfast afterward when my digestive fire has really been warmed up and my body is ready for food. It’s a super soothing routine—I highly recommend you pull parts that speak to you! When did you begin studying Ayurveda? What about it do you find so special? I began studying Ayurveda in 2012 when I had my own chronic health issues, including digestive and hormonal imbalances. I love that Ayurveda is not a diet, but rather a system that offers a deeper introspection on food and life. It is a living science, one that has been adapted over centuries to fit the needs of the people it serves. This flexibility is what has made Ayurveda the world’s oldest health system that is still practiced today. The holistic view of Ayurveda is more vital now than ever before. So many people, like myself, have grown tired of jumping from diet to diet, looking for the answer to health when it already exists inside of us. All it takes is tuning in and listening. Just as there is no one-size-fits-all approach to health, there also isn’t one for your diet. Ayurveda teaches you how to customize your recipes for your unique mind-body type (your Dosha), so you can make the right food choices for what you need, when you need it. Not only will these recipes address physical imbalances, but they’ll also tackle the common mental struggles we may experience on a daily basis: anxiety and insomnia, which are related to excess Vata; impatience and irritability, which are related to excess Pitta; and loneliness and depression, which are related to excess Kapha. How can I tell what my Dosha is? Is it possible for a person to be more than one Dosha? One of the best ways is to take my quiz here! Unlike any other Ayurvedic quiz, I separate the results between the mind and the body and break down each into percentages, giving you a detailed analysis of what your Doshic constitution is today. I recommend following the lifestyle suggestions for your Dosha in your mind and the dietary for that in your body. My book Idiot’s Guide to Ayurveda has lots of suggestions and an even more detailed quiz. Okay, so I’m a _______. What does that mean? We are a combination of all three Doshas but in varying amounts. Some of us are naturally more airy, while others are naturally fierier and others more earthy. Vata is cold, dry, and ever-moving, like the fall wind. Mentally, Vata types are creative freethinkers who require constant change, easily becoming bored with the mundane. Ideas circulate through their minds like the autumn leaves and sometimes it’s difficult to organize the tornado in their heads. They’re big over-thinkers and when out of balance are prone towards anxiety, eating disorders, and insomnia. Physically, Vatas are cold and dry like the fall leaves. They have dry skin and hair and often feel cold. Their appetite varies like the wind, sometimes strong and other times meek. They love movement and exercise, but can easily overwork themselves, becoming fatigued and weak. Internally, Vata types are prone towards the accumulation of air (bloating and gas) and dryness in the colon (constipation). Pitta is fiery like the summer heat. Mentally, Pitta types are driven hard-workers who thrive in competition. They’re task-oriented realists that will do whatever it takes to get the job done. Excessive heat accumulation can cause them to become impatient and agitated, though they’re generally strong leaders. Physically, Pitta types contain a great deal of heat that needs to be released. You can often see the signs of fire in their body manifesting as red tones in their hair and a flushed face. They become overheated easily and cannot tolerate hot, humid days. They perspire more than the other Doshas and are naturally well-muscled. They require strenuous exercise to cool down their bodies and can become addicted to exercise. They have more oily skin and hair that is prone towards acne. Internally, Pitta types contain a great deal of fire and are able to digest about anything. They often expel superfluous stomach acid, suffering from heartburn and hyperacidity. They do best in routine and their fire comes out when they’ve missed a meal! If you’re a Pitta, be sure to eat regularly so as to avoid moodiness. Kapha is moist, soothing and cold like the spring. Mentally, Kapha types are patient, kind and loyal. They are humorous good-listeners who everyone comes to when they need a rock. However, Kapha types tend to suppress their throat chakras and lock in caged emotions, feeling lonely and depressed. They are prone towards self-indulgent behaviors and binge-eating, convincing themselves it’s a better idea to stay home and start their workout routine on another day. They’re slow to initiate change and find comfort in their routine. Physically, Kapha types have cold hands and feet due to malcirculation. However, unlike Vata they do not have dry and rough but rather moist and soft skin. Kapha types tend to overeat and are prone towards water retention, sluggish metabolism, and weight gain. Internally, Kapha types have a slow metabolism, often feeling sluggish after a meal. They are attracted to rich, creamy foods like dairy and desserts which have similar characteristics to Kapha energy, making them feel heavier. Where did the ideas of Doshas originate? Why are they important? The Doshas come from the Vedas, the world’s oldest recorded texts, originating back over 5,000 years ago in ancient India. They are important because they can define all things—people, food, seasons, places, emotions, processes of the body. Understanding the Doshas gives you a deeper understanding of life. How do you personally care for your Dosha? I’m a Vata-Kapha, which are both cold energies so I eat more warming foods, drink lots of tea, stay away from anything dry or crunchy, like crackers, popcorn, and granola bars, and only eat raw foods when my Pitta (fire) is up. I also practice fasting—since my Prakriti or natural birth constitution has a lot of Kapha in it—and exercise every day, but not too rigorously. Pilates and yoga are my favorites. I’m constantly fine-tuning what I need according to how I feel. I have been plant-based for over a decade and healed my body without the use of ghee, milk or cheese, which are in the traditional Ayurvedic diet. I believe that we can take the best of Ayurveda (eating right for our Doshas) but combine them with modern superfoods and ingredients around the world for the optimal diet. Some things in Ayurveda, like not eating mushrooms or fermented foods, I don’t believe are necessary in today’s world—in fact, mushrooms are one of the healthiest foods on the planet and fermented foods are great for rebalancing the gut! Ayurveda is also traditionally against all raw food, but that is because they were not safe to consume in India—and still aren’t due to bacteria and amoebas in the soil. I also don’t believe we need to only eat Indian food to follow Ayurvedic guidelines. Our bodies and the environment has greatly changed in the past 5000 years so our diets must adapt with it. How can we use tea to benefit our Doshas? Tea helps bring our body back into balance by feeding us the exact spices and herbs we need. In Ayurveda, spices are seen as medicine. I call teas “potions” in my book because they’re exactly that. They can heal any imbalance, from upset stomach to a headache, when paired with diet and lifestyle. They’re also warming for the digestive fire, meaning they help to enhance digestion. We don’t only digest food, but also thoughts and emotions, and having a strong digestion helps us handle life’s curveballs. Teas also help us to press the pause button in our often too-chaotic schedules. We’re able to take a moment to sit down, go inward, and find gratitude. We notice the flavors of the tea and build a practice of mindfulness. Tea is meditation. It’s not just about nourishing your body—when you drink tea, you’re nourishing your spirit. And at the end of the day, a full heart and soul help us to truly come into ourselves. Still hungry for nourishment? Us too! For more information on herbal wellbeing and Ayurveda, visit Pukka Herbs and Sahara’s website.